We normally talk about building a loading/work platform or a debris chute but not a combo loading platform and debris chute in one. 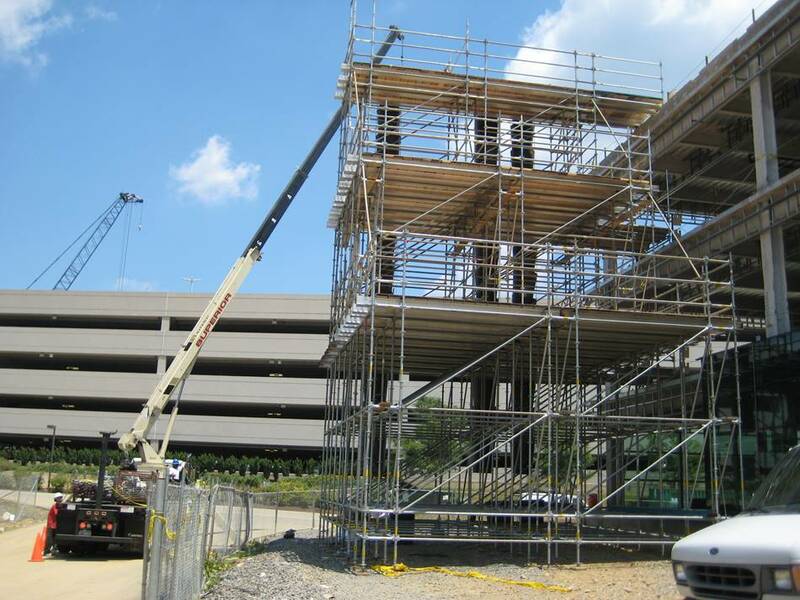 Well here it is – a combo platform at CSC (Corporate Service Company) in Wilmington, DE. 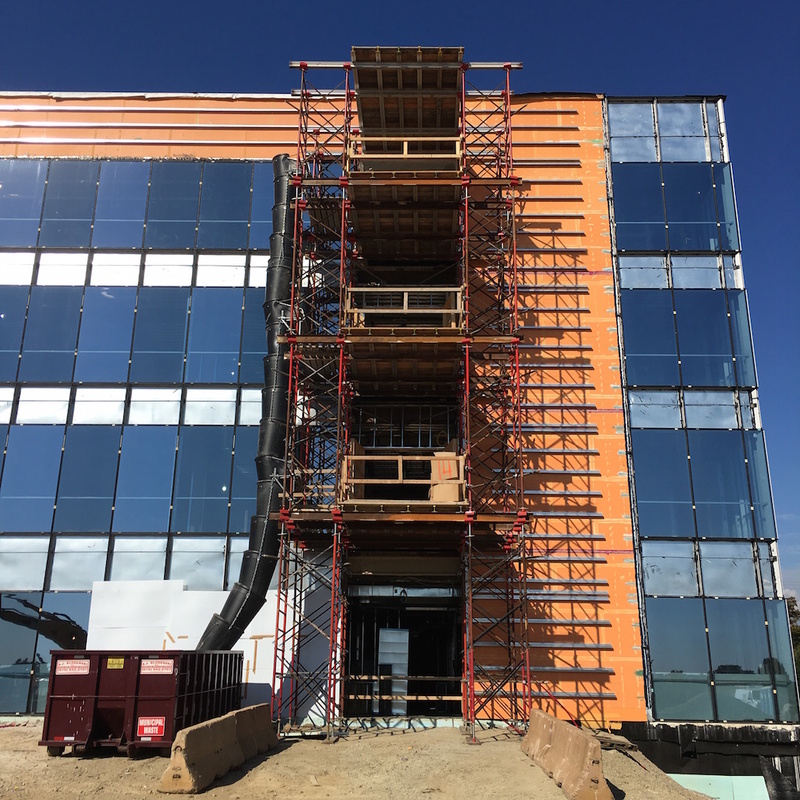 Our customer called Superior Scaffold and asked if we could come up with a solution to load material into the building while at the same time allowing debris to be moved out. And this is what we came up with. You see, this ain’t our first rodeo folks (see below). But this one is constructed from shoring posts and hi-load frames and not system scaffold. That is because of the weight of the material being brought into the building. It needed to support heavier loads of everything necessary for the construction of the interior (skids of equipment, drywall, studs, electrical, mechanicals, etc). You’ll also notice that the lower floors have steel beam support joists, for that very reason. The top has aluminum beams. And obviously, there is a fantastic debris chute attached to the left side that allows access at each level. Below, see the free-standing combo loading platform and debris chutes. Yes, I said chutes! Take a look at this beauty we erected for a major technology company a few years back. They were striving for a zero carbon footprint and wanted everything recycled on the job. This platform was constructed out of system scaffold that had 3 debris chutes that went into individual recycling collection dumpsters. 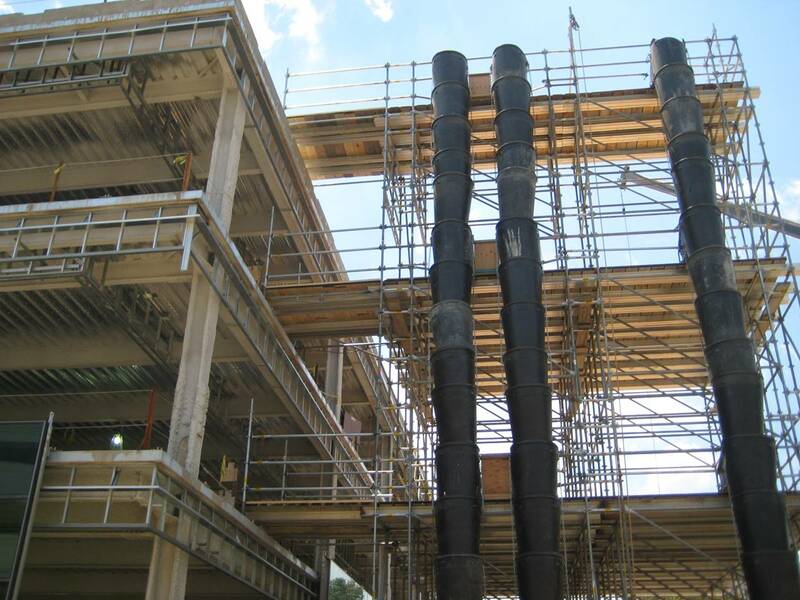 How cool is that – striving to recycle all waste from a construction project! You don’t realize just how much is generated on a single job. So there you have it, two great examples of loading platform & debris chute combos. 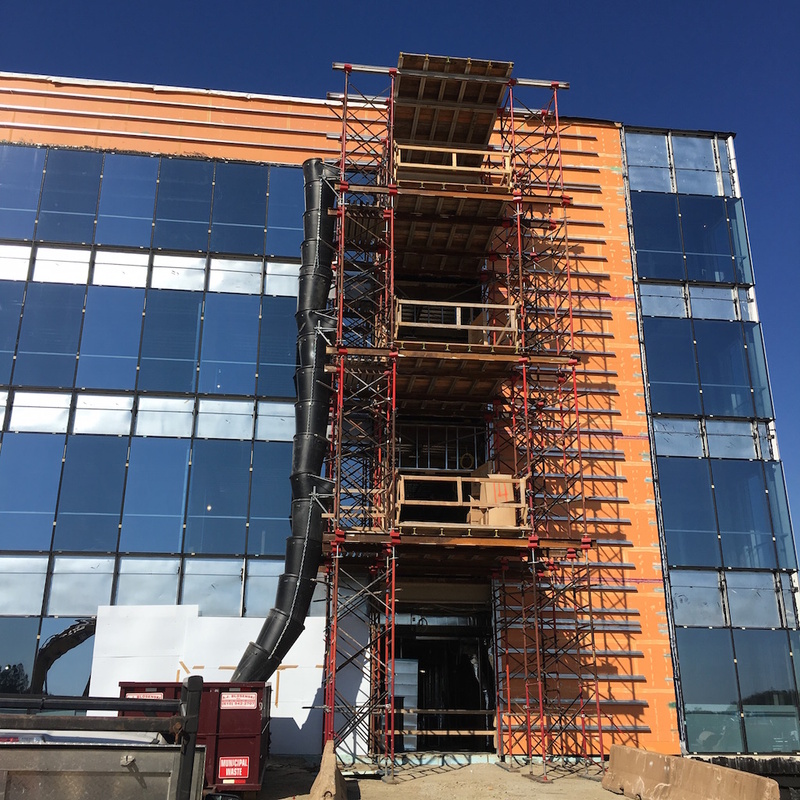 If you need access solutions of any kind call Superior Scaffold today at (215) 743-2200 and ask for Tony P… He’ll hook you up. 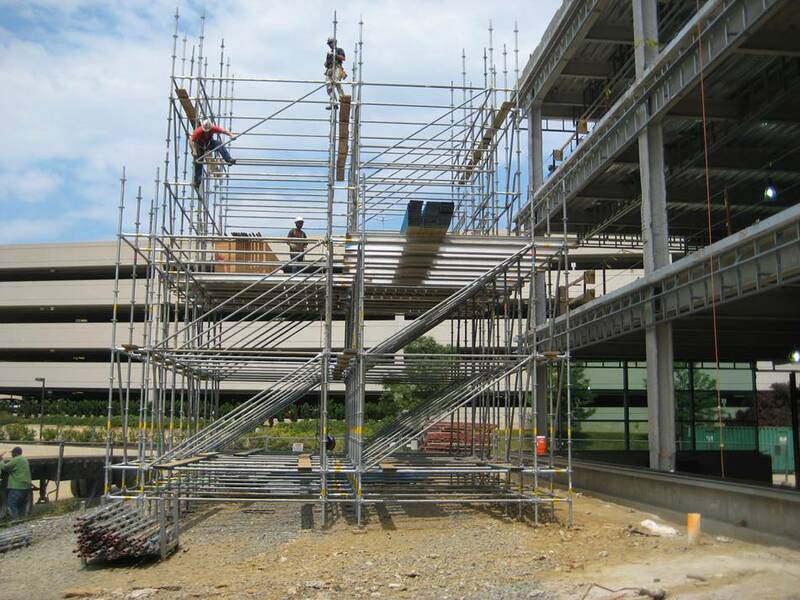 Or you an visit www.superiorscaffold.com to see more samples of our work. And no post would be complete without our musical interlude. This is just perfect for today – for no other reason than I couldn’t get it out of my head. Earworm time. This entry was posted on Thursday, October 20th, 2016 at 7:23 am	and is filed under News & Updates, Shoring. You can follow any responses to this entry through the RSS 2.0 feed. Both comments and pings are currently closed.